It’s almost impossible to earn a ranking ahead of Bryce Harper, but philosophically we consider a pitcher with present ace stuff and Major League opportunity to be more valuable than even a likely Hall of Fame hitter. 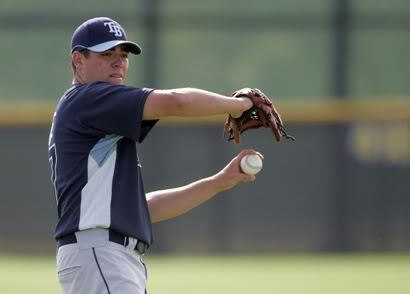 Moore made considerable steps forward in 2011 in the command department and catapulted himself forward into becoming the top pitching prospect in the game. He then went on to make three appearances during Tampa’s stretch into the postseason before tossing seven innings of two-hit baseball to open the Division Series in Arlington. Pretty impressive for a 22-year-old. Moore is 6-foot-2 with extremely clean and effortless mechanics. His body projects, but honestly, what do we need to project here? Moore is the easiest 70 fastball guy in baseball. His secondary stuff and command are top shelf, and his makeup is championship caliber. His fastball reaches 97 mph. His breaker is a deadly downer that consistently receives double-plus grades. His changeup is an easy plus pitch with double-plus potential. His slider is new and rarely used, but it is also plus. Stephen Strasburg didn’t even have four plus pitches as a 22-year-old, and he isn’t a lefty. Matt Moore will challenge for a Cy Young as soon as he is given slack on the leash to grab 100 pitches per start and 32 or so starts per season. There is not a pitcher in the game today I would rather have signed long-term than Matt Moore. Not Gerrit Cole. Not Tim Lincecum. Not Strasburg. Not Justin Verlander. Not Clayton Kershaw. Matt Moore will be the American League’s best pitcher sooner rather than later. There just isn’t very much to say that hasn’t already been said about Harper. He is, in our opinion, the greatest offensive prospect in history, and he is second only to Strasburg in terms of history’s greatest prospects. For an 18-year-old, Harper was insane in 2011. He slashed .297/.392/.501 on the year across two levels including 37 games in Double-A. He went deep 17 times and stole 26 bags. 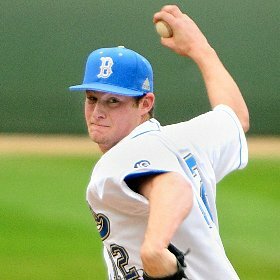 He has no weaknesses aside from a lack of familiarity with professional secondary stuff, as his 87 strikeouts suggest. Nevertheless, he is a quick learner and has already softened his stride to account for better breaking pitches. He followed up the Double-A season with a terrific 25 games in the Arizona Fall League, posting a 1.034 OPS and going deep six times. Perhaps the most impressive aspect of Harper’s professional debut, though, was the fact that he seemed so comfortable being at the levels that he was. The Sally League is no joke, and obviously an 18-year-old in Double-A is something to take note of. He showed some flexibility in the outfield, collecting some innings in center as well as right. His bat plays anywhere, but can you imagine a homerun champ in center? He’d be Griffey Jr. And that’s exactly what we think of Harper. He can be one of the greatest players in the history of the sport. We expect him to return to Harrisburg to open 2012, but no one would be surprised if he is quickly promoted to Triple-A and ultimately finishes the year in Washington. We expect him to open 2013 in the Nationals outfield and to basically retire there 15 years or so down the road after winning several MVPs. Bundy is without a doubt the best prep pitcher to come along in a very long time, if ever. Based on a purely statistical measure, he is without equal, striking out more than two hitters per inning playing for a school that spent most of the year with the No. 1 national ranking. High school stats are next to meaningless…unless they are that astoundingly dominant. 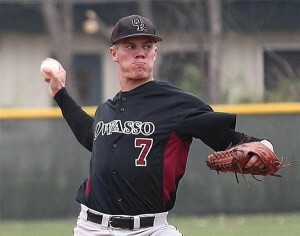 He naturally was awarded the Gatorade National Player of the Year award across all sports. The Orioles must have peed themselves when they saw him there at No. 4, and Bundy would not be at No. 4 in any of the last 10 drafts either, but the 2011 class was exceptional. Bundy is the kind of arm that really makes you wonder how he can be just a teenager and without a day of collegiate experience. His mechanics are smooth and repeatable. His athleticism is through the roof. He trains extremely hard and has outstanding makeup, and we haven’t even begun to talk about his stuff. Bundy features a mid- to high-90s fastball that has reached triple digits, a plus curveball with good shape and consistency, a cutter that routinely gets 70 grades, and a solid average changeup with a high likelihood of giving Bundy his fourth plus or better pitch down the road. We expect Bundy to start the year in Easy A and totally blow it away. The Orioles recently have been criticized harshly for rushing their young starters up too quickly without allowing them to refine mechanics and secondary stuff. Bundy, however, needs no refinement, so we expect him to spend three years at most in the farm. He very well could finish the 2012 season with a couple of appearances in Double-A if everything goes the way we think it can. Dylan Bundy has a chance to be the best pitcher alive for several years. Aside from a team-issued suspension for being an idiot, Shelby Miller had an outstanding 2011 that only served to reinforce his spot as the top righty in the Minor Leagues. He posted a 2.77 ERA in 25 starts across two levels including his final stop in Springfield where he collected 16 Double-A starts as a 20-year-old. Yikes! The kid struck out 170 guys on the season next to only 53 walks in just under 140 IP. Again, Yikes! His fastball has tremendous sink and arm-side ride to go along with 94-97 mph of pace. His changeup and curveball already get 50s, but they still have room to grow. His breaker is tight with quality shape, but it is not consistent yet. The changeup is ahead of the bender, and it features excellent fade that should allow him to neutralize lefties in the Bigs as he already has shown he can do on the farm. Miller should open the year in Triple-A with the singular goal of developing his secondary stuff. 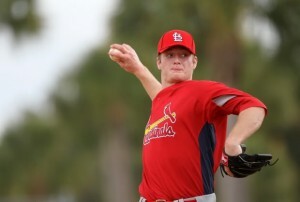 Should he prove to accomplish this early on in 2012, we see no reason for the Cardinals not to push for his promotion. Miller is elite and, with a 6-foot-3 and projectable build as well as aggressive and competitive makeup, should steamroll his way to Busch and challenge for the ace role there immediately. We expect Miller to annually receive CY votes. Cole was the first guy off the board in 2011, and it is pretty tough to make a strong case against that pick (except for the $8 million price tag). We did not view him as the top guy available, but no one could blame Pittsburgh for viewing him as just that either. Cole has reached well beyond the 100 mph plateau, and his changeup was the best changeup of any draft class in recent memory. He also features a knockout slider that routinely gets 60 grades. He has a terrific arsenal of pitches and has average or better command as well. His mechanics are hit and miss, though, which is why we liked several guys a little more than Cole going into the draft. With someone of his caliber, it’s really just nitpicking. Gerrit Cole has a chance to be the best pitcher in baseball and immediately ascended to the top of the Pirates’ rankings ahead of noteworthy players like Jameson Taillon and Starling Marte. Cole looked a little sloppy in the AFL, but he still was able to make five starts and record 15 innings of professional baseball. Let me just take this time to mention how terrific we at The Sombrero think the AFL is, especially for those guys like Cole and Hultzen who signed late and are looking to snag their first few starts of professional baseball before winter shut-downs. Anyway, Gerrit Cole is absolutely a stallion and he should debut early in 2013.